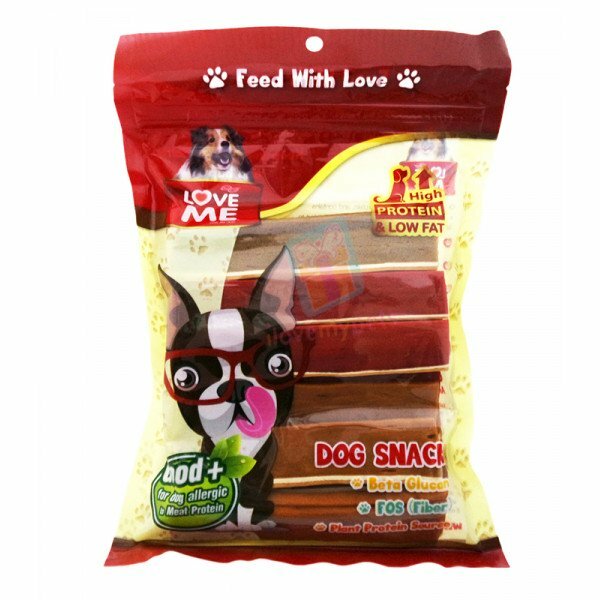 Love Me Soft Dog Snack (Strap) Made in Thailand (Best For Dogs Allergic to Meat Protein) Approx 50 pcs. Our product is tender, rich in protein, and contains a mix of healthy ingredients. It is specially formulated to have a good aroma and great taste that your dog will love.Beta Glucan maintains dog's digestive and immune system in good healthPrebiotic..
Our product is tender, rich in protein, and contains a mix of healthy ingredients. It is specially formulated to have a good aroma and great taste that your dog will love. Prebiotic enriched with Fructo-Oligosaccharide (Fiber) promotes digestive and excretory system. The flavour and taste of the LOVE ME products have been thoroughly researched in order to satisfy dog's preferences. We provide healthy dog snacks with high quality ingredients.